This chapter reviews the available empirical evidence on the performance of Flegg’s location quotient (FLQ) and Kronenberg’s Cross-Hauling Adjusted Regionalization Method (CHARM), a relatively new non-survey technique that accounts explicitly for cross-hauling when constructing regional input–output tables. The performance of the FLQ and related formulae is evaluated using official data for 20 Finnish and 16 South Korean regions. The results confirm previous findings that the FLQ can produce far more accurate estimates of regional output multipliers than can simpler LQ-based formulae such as the SLQ and CILQ. We also explore possible ways of determining suitable values for the unknown parameter δ in the FLQ formula. Finally, we carry out a detailed investigation into an innovative new approach, Kowalewski’s sector-specific FLQ (SFLQ), but find that further work is required before the SFLQ can be recommended for routine use. Our assessment of CHARM employs official data for two contrasting regions: Uusimaa, the largest Finnish province, and the central Chinese province of Hubei. In the case of Uusimaa, detailed data for 26 regional sectors in 2002 are examined. CHARM is found to perform relatively well in terms of estimating exports, imports, the volume and balance of trade, and supply multipliers. The results are particularly encouraging for manufacturing sectors, which typically produce heterogeneous commodities and where cross-hauling is rife. As regards Hubei, CHARM is used to construct a detailed regional input–output table with 42 sectors, including 17 diverse types of manufacturing. The analysis makes use of official published national and regional data for 2007. However, in this instance, CHARM does not generate realistic estimates of Hubei’s sectoral exports, imports, volume of trade, and supply multipliers. This outcome is attributed to the difficulty of estimating regional technical coefficients, the heterogeneity of commodities and final demand for this data set. This problem is linked to the relatively small size of Hubei, which generates around 4% of China’s GDP. By contrast, Uusimaa produced 34.6% of Finland’s national output in 2002. These findings highlight the crucial importance, especially in relatively small regions, of adjusting for any known divergence between regional and national technologies, heterogeneity and final demand. Flegg, A. T. and T. Tohmo, A comment on Tobias Kronenberg’s “Construction of regional input–output tables using non-survey methods: the role of cross-hauling”, International Regional Science Review, Vol. 36, No. 2, 235–257. Copyright ©  (SAGE publications). Reprinted by permission of SAGE Publications. https://doi.org/10.1177/0160017612446371. Flegg, A.T., Y. Huang and T. Tohmo, Using CHARM to adjust for cross-hauling: the case of the province of Hubei, China, Economic Systems Research, Vol. 27, No. 3, 391–413. Copyright ©  (The International Input–Output Association). 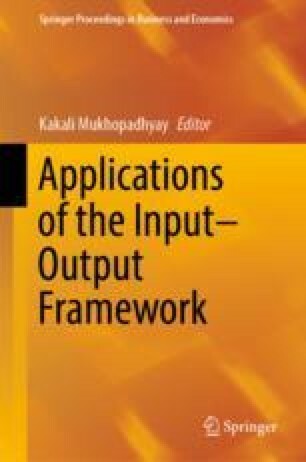 Reprinted by permission of Taylor and Francis Ltd., http://www.tandfonline.com, on behalf of The International Input–Output Association. http://dx.doi.org/10.1080/09535314.2015.1043516. Timo Tohmo gratefully acknowledges funding from the Strategic Research Council at the Academy of Finland for the project “Beyond MALPE-coordination: Integrative envisioning” (number 303552) and from Jyväskylä University School of Business and Economics. Finally, Tony Flegg would like to thank the Department of Accounting, Economics and Finance at the University of the West of England, Bristol for making it possible for him to attend the IORA conference. Flegg, A. T., & Tohmo, T. (2017). The regionalization of national input-output tables: A study of South Korean regions. University of the West of England, Bristol, Economics Working Paper Series 1705. http://www1.uwe.ac.uk/bl/research/bristoleconomicanalysis. Flegg, A. T., & Tohmo, T. (2018). The regionalization of national input-output tables: A study of South Korean regions. Papers in Regional Science, first published online Feb 2018. https://doi.org/10.1111/pirs.12364.